A Long Island native, Glenn Durlacher has been sculpting professionally for more than 30 years. His sculpting career began with creating ice sculptures while working as a banquet chef for Marriott hotels. Over the years, he has sculpted centerpieces for many prestigious events, including Hilary Clinton’s senatorial campaign and the First Night New Year celebrations in Albany and Saratoga Springs. In 1985, he was featured on national television with PM Magazine and with Christine Jansing of CNBC. In 2009, he moved to Glens Falls, New York, and opened Glenn Tree Art, a studio and outdoor sculpture garden, now located at 1048 State Route 9, in Queensbury, New York. 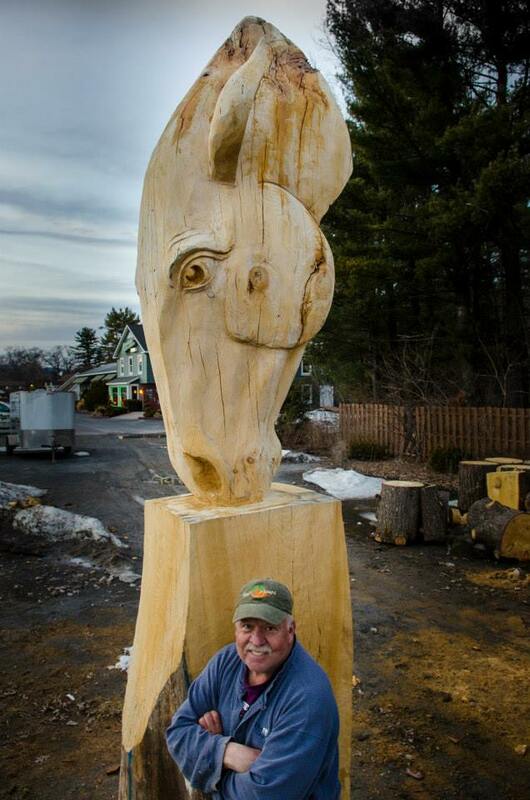 Glenn specializes in custom stump carving, wildlife and pet sculptures and beam carving. To see what Glenn is creating, follow him on Facebook! Sculptor Glenn Durlacher creates masterpieces carved from wood, including custom art with trees (stump carving), statue carvings of pets and wood sculpture. He is based in the Adirondacks/Lake George, New York area. Stop by or make an appointment. Come see the sculpture garden and live demonstrations. Copyright © 2014 Glenn Durlacher. Site by Advokate.